The above is an image map, use it to navigate the site. Best viewed at 1280 x 1024 using any browser. Mullardoch is the largest dam built by the Hydro Board. Not the highest - that's Sloy - but the largest; 2,385 feet long, by 160 feet high. Loch Mullardoch, the reservoir formed by the dam, represents the considerably enlarged conjoined loch formed from the union of the pre-dam Loch Mullardoch, and Loch Lungard, which lay to the west. 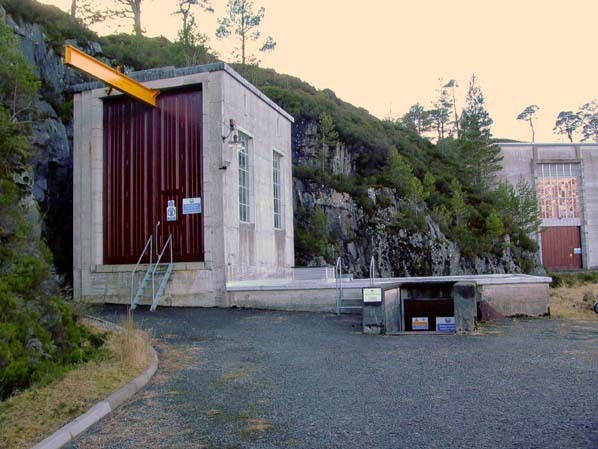 It is the main storage reservoir for Fasnakyle power station, which lies in Glen Cannich, to the south. Water from Loch Mullardoch is led through the mountains dividing the two glens by a 17,000 foot tunnel, which discharges into Loch Benevean. From Benevean, a further tunnel takes the water to the power station at Fasnakyle. The reason for this two-stage arrangement is simple: amenity. Loch Benevean, and Loch Affric (to the west) lie in an area of great natural beauty. 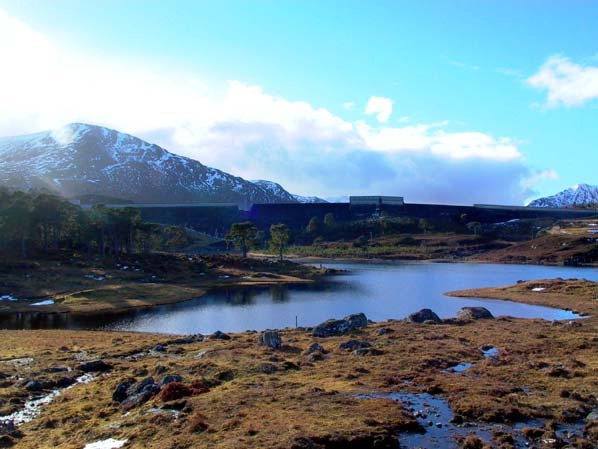 It would have been impolitic to propose building a massive dam at Benevean, grossly enlarging and uniting lochs Benevean and Affric, and providing the main storage of the scheme there. There would have been enormous opposition to this, especially since seasonal fluctuations in runoff would have required considerable drawdown of the reservoir, creating a very unsightly zone of bare rock along the shore of the reservoir when the water was low. Instead, a relatively small dam was built at Benevean, which only raised the level of Loch Benevean by a small amount, and didn't affect the level of Loch Affric at all. Also, only a very limited drawdown of Loch Benevean is permitted, minimising the 'tide rim' effect on the shore of the loch. To keep the level of Loch Benevean within permitted levels during periods of low runoff, water is supplied from the main storage at Mullardoch. There is, on average, a difference in level between lochs Mullardoch & Benevean of 80ft (~25m). 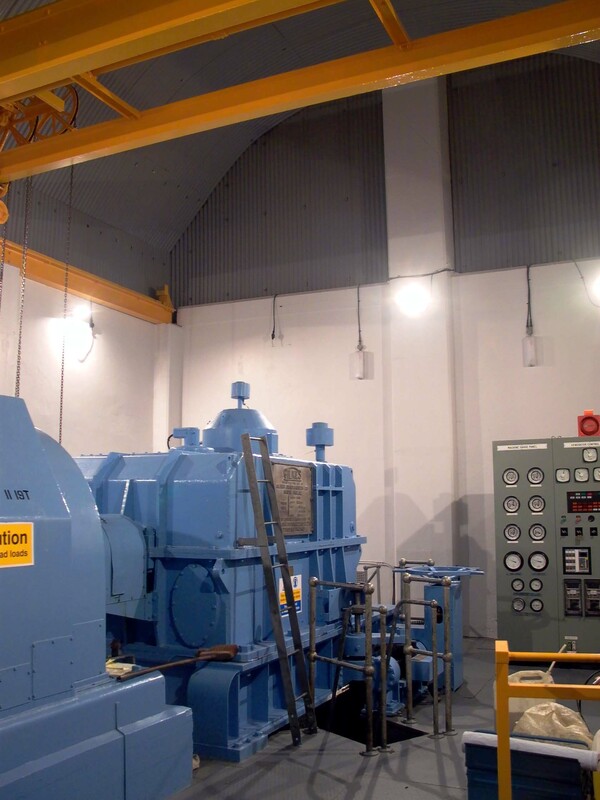 To take advantage of this, a small (2.4MW) underground power station was constructed at Mullardoch as an 'afterthought', after the completion of the rest of the scheme; the dam and tunnel were completed in 1952, the power station in 1955. The result is unique in Scotland; an undergound power station with no tunnel access, just a vertical shaft. There are 31 images of Mullardoch in the Records, and 4 webpages. They may all be accessed via the links at the bottom of this page. Each link will open in a new window.